There is no better time to visit Maine than summertime. With 3,478 miles of coastline, the most on the Atlantic coast, the warmer months are the best time to enjoy the quintessential New England seashore that is present throughout the state. Wherever you’re headed in Maine, you can be sure that in there will be plenty of the state’s favorite summertime treats: lobster and blueberries. And it’s a pretty good bet there will be a picturesque lighthouse or two. Here are a few of our favorite spots. 1. Portland — This bustling city provides its visitors with a city that sophisticated and effortlessly cool, while maintaining the quintessential qualities of a city on the bay. Hipsters wearing flannels live happily alongside plaid-wearing authentic lumberjacks. If summer vacation without your furry friend just isn’t the same, then Portland is the perfect destination to bring him along. It’s one of the most dog friendly cities in the country. With a thriving tech industry and an innovative culinary scene, it’s not a city that lives in the past, but still celebrates its heritage. The Old Port is one of the most popular destinations with cobblestone streets, 19th century brick buildings and fishing piers. Plan on a craft beer from one of the many local breweries and a ferry ride to visit the nearby Casco Bay Islands. 2. Bar Harbor — The most well known town on Mount Desert Island, this is the perfect place to set up home base for your explorations of the magnificent Acadia National Park. The Shore Path is a remarkably beautiful walk that runs alongside the harbor, and will have you imagining your vacationing in a genteel Victorian setting. If you’re looking for a bit more action then how about a sea kayaking trip? Or plan a hike to the top of nearby Cadillac Mountain for unparalleled views of all of Mount Desert Island. Not in the mood for a long hike? You can also drive to the top. Whatever you do, don’t forget to try the locally made blueberry soda, or beer! 3. Camden — With an amphitheatre and an opera house, Camden is the perfect place to take in some performing arts after you’ve eaten your fill of lobster. If you’re more inclined to take in the sea air from up close, book a sail on the historic Schooner Surprise. There’s no better place from which to view the town’s rolling hills. 4. Kittery — If you’re driving to Maine from the south (and if you’re not driving from Canada you probably are), Kittery is one of the first towns you’ll encounter, and makes for a hearty welcome to the state. Because it’s just across the river from Portsmouth, NH, a stay here also means you get to sneak in time at another New England favorite. Looking to take in a bit of history? Or just a beautiful view from the Kittery Peninsula? Then a visit to Fort McClary is in order. And you can’t go to Kitttery without shopping! Kittery is a favorite across all of New England for its incredible outlet shopping. 5. Ogunquit — If pristine tranquility is what you seek in your Maine vacation, then Ogunquit is perfect for you. A fishing village that moves at a relaxed place, you’ll find no shortage of whitesand beaches. 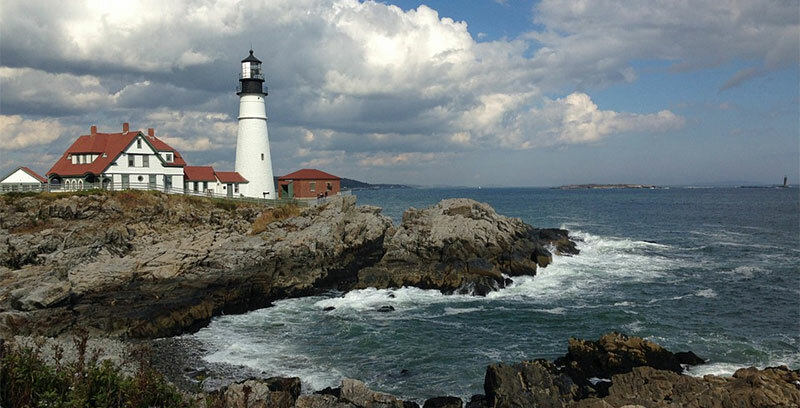 Take a hike on the Marginal Way Trail or visit the Ogunquit Museum of American Art. Or just lounge on the beach and spend your evening dining at an outdoor restaurant. 6. Augusta — With a population less than 1/3 that of Portland, Maine’s capital is a great place to experience history and culture in an engaged civic center that avoids the crowds. There’s no better place to learn about the history and current affairs of Maine than at the Maine State Museum or the State Capitol. If you’re looking to unwind, Augusta has numerous fine spas and is famed for its two golf courses. 7. Rockland — With all the sunshine of summertime in Maine, it’s hard to feel down, but that doesn’t mean you can’t enjoy the blues. Though this major shipping town hosts many festivals throughout the year, the North Atlantic Blues Festival is the big one. But regardless of whether you go during the festival, you’ll still find plenty to do. As one of the largest shipping centers of lobster in the world, this is as good a place as any to have that lobster dinner, or two or three. Instead of staying in one Maine’s many fine bed and breakfasts, consider booking a week on a tall ship in the harbor. And learn everything there is to know about lighthouses at the Maine Lighthouse Museum. Thanks for the great tips on places to visit in Maine! My wife and I are planning a trip to Maine over the summer, and we want to make sure we see everything there is to see! My wife and I both love opera, so Camden might be a great place for us to visit. We will have to look into it!